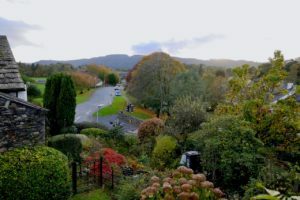 Troutbeck Cottage is located in a small community of Lakeland cottages, away from the crowds of Ambleside and Windermere. The cottage offers a comfortable and homely base from which to explore the surrounding area. We were awarded a Visit England 4 Star Gold Award rating in February 2019. The lounge has a stone fire surround with inset wood-burning stove. The lounge is furnished with traditional seating and period-style, quality furniture. We provide free Wi-Fi internet access, a widescreen 40″ Samsung 4k TV with Netflix and Freesat and a Sonos surround sound speaker system. There is a UHD/Blu-ray player and a Marantz CD player with DAB/FM/Internet radio and Spotify music streaming. There is a good selection of books, CDs and videos and general information covering the Lake District. Also on the ground floor is a fitted dining kitchen which is well equipped with an electric induction hob and oven, microwave, dishwasher, washer/dryer and fridge/freezer. There is a comprehensive range of Villeroy & Boch porcelain, cutlery and glassware. Upstairs, the main double bedroom at the front of the cottage has views towards the distant hills. The bedroom is fitted with reproduction French-style period furniture and has an en-suite shower room. This bedroom has a bright and airy feel to it which is complemented by the exposed beam and period furnishings. 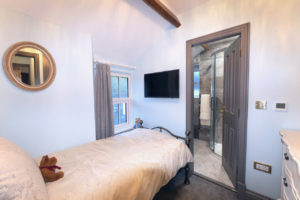 The second bedroom has a single bed and also has an en-suite shower room. Both bedrooms have wall-mounted Samsung TVs. All bedlinen is included. 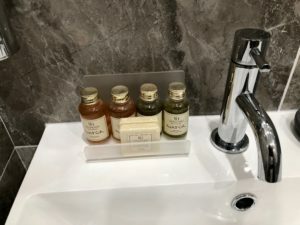 The marble-tiled en-suite shower rooms have digital electronic shower valves, heated towel rails and Christy Egyptian-cotton towels and complimentary toiletries. Gas central heating is installed with radiators in all rooms. 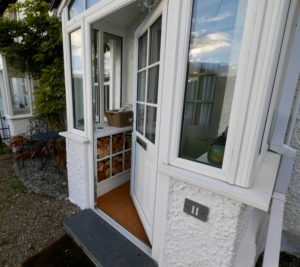 Outside there is a small lawned to the front of the cottage which faces south with views towards Claife Heights and the Grizedale Forrest. At the rear, there is a shared courtyard leading to the open fields and fells beyond. Within the rear courtyard, Troutbeck Cottage has its own allocated parking space for one vehicle. 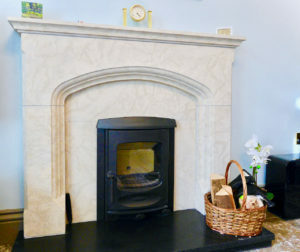 The cottage offers a homely and comfortable retreat throughout the year.